CAPA presents An Acoustic Christmas with Over the Rhine at the Southern Theatre (21 E. Main St.) on Saturday, December 15, at 8 pm. Tickets are $35 and $37.50 and can be purchased in person at the CAPA Ticket Center (39 E. State St.), online at www.capa.com, or by phone at (614) 469-0939 or (800) 745-3000. 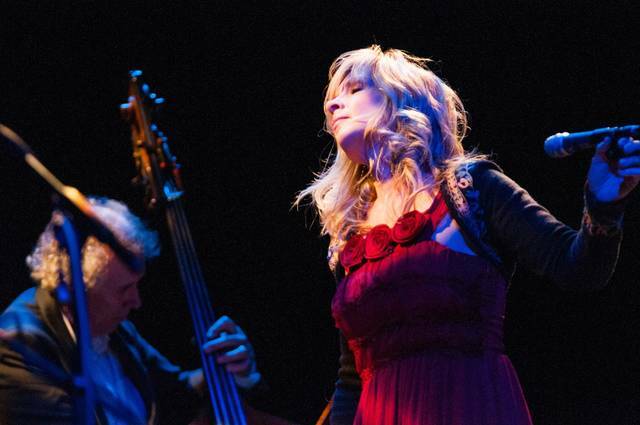 Native Ohioans Detweiler and Bergquist launched Over the Rhine as a quartet in the spring of 1989, naming the ensemble after the historic, bohemian Cincinnati neighborhood Over-the-Rhine where they lived and first wrote and recorded together. Their early demos and performances quickly struck a chord with listeners, and they had am established local following by the time they launched their recording career with a pair of well-received independently released albums, Till We Have Faces (1991) and Patience (1992). Over the next two decades, Over the Rhine has continued to build a musically and emotionally potent catalogue, encompassing the studio albums Eve (1994), Good Dog Bad Dog (1996), Films For Radio (2001), Ohio (2003), Drunkard’s Prayer (2005), The Trumpet Child (2007), The Long Surrender (2011), Meet Me at the Edge of the World (2013); the holiday-themed The Darkest Night of the Year (1996), Snow Angels (2006), and Blood Oranges in the Snow (2014); the live Changes Come (2004); The Trumpet Child (2007); The Long Surrender (2011); Meet Me at the Edge of the World (2013); and a series of limited-edition CDs featuring live, rare, and unreleased material. The Christmas shows resulted from a public radio station request more than 20 years ago to perform some seasonal songs. Afterwards, Over the Rhine began receiving inquiries about whether any of the songs had been recorded, and this eventually led to the release of the group’s first song cycle of Christmas-themed original songs and traditional carols, The Darkest Night of the Year (1996). In 2006, they released Snow Angels, the group’s first full collection of original Christmas/holiday songs, followed by their third holiday album, Blood Oranges in the Snow, in 2014. Over the Rhine continued to tour every December, creating an annual tradition with their special, year-winding-down concerts for their extended musical family.